Bristol City winger Callum O'Dowda has been picked to start in tonight's World Cup play-off first leg against Denmark in Copenhagen. Daryl Murphy starts ahead of Shane Long up front after his strong performances against Moldova and Cardiff last month. There were doubts over the fitness of Jeff Hendrick and Stephen Ward but both are named in the starting XV. Ciaran Clark captains the side from centre-half where he partners the in-form Shane Duffy. 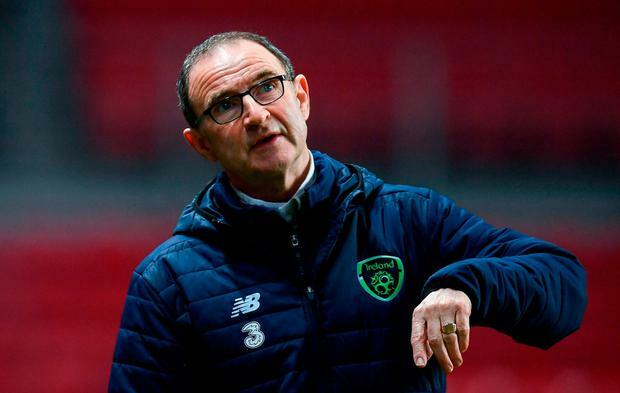 Ward and Cyrus Christie fill the full-back berths with Robbie Brady, Jeff Hendrick and Harry Arter playing behind O'Dowda, James McClean and Murphy. Denmark coach Age Hareide has made five changes to the side which drew 1-1 with Romania as Peter Ankersen, Andreas Bjelland, Jens Stryger Larsen, Andreas Cornelius and Nicolai Jorgensen return.